Yesterday, Scholastic published a sneak peek at its forthcoming report on what kids and their families are reading. The results are, to me, not surprising, totally fascinating, and super useful as we work to build our school library collection. Check out the infographic on Scholastic's site here. - Kids want books that make them laugh. - Kids want good, rich, creative stories that give them opportunities to use their imaginations. - Kids want books with characters who inspire them. - Kids want books with characters who look like them. This last point brings me to a brilliant movement in the book publishing world, #WeNeedDiverseBooks. Based on the idea that young people need to see themselves reflected in the books they read, this group of writers and readers has created a powerful and compelling campaign to raise awareness of the lack of diverse characters in books for young people and to make positive change in the world of children's book publishing. The SK library supports the mission of the We Need Diverse Books campaign and aims to create a library collection in which all children will see themselves, their lives, and their experiences reflected in the books on the shelves. How can we get more good books into more kids' hands? Check out some of these best-of-the-year lists. Personally, before I commit to reading a book (or recommending a book to a child) that I've discovered on a "best of the year" list, I cross check other lists to see if it appears in multiple places. After all, starting a new book based solely on the recommendation of a stranger is a rather risky endeavor. That being said, here are several lists from which to cross check (if you so desire). Happiest of end-of-the-year reading to you. 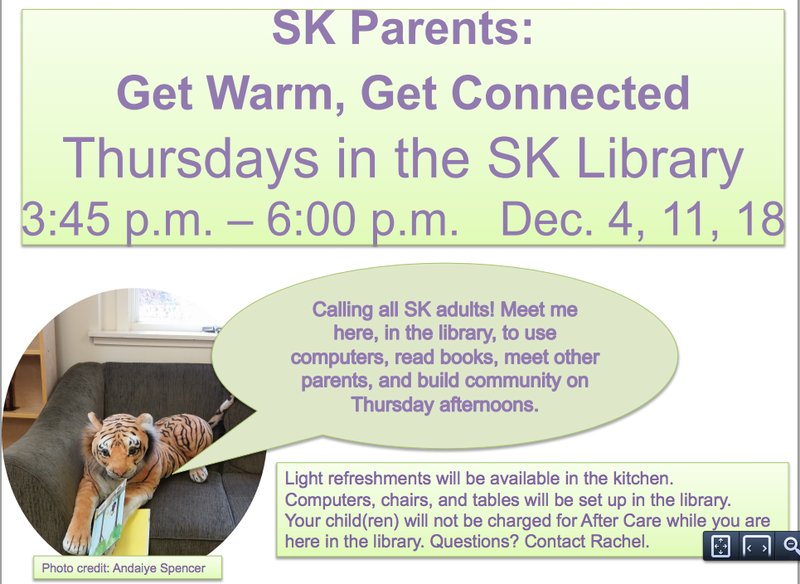 Join other adult members of our school community in the SK library on Thursday afternoons, beginning December 4, 2014, for community-building and warmth (of the literal and figurative varieties). If you have questions about this, please ask. We're very excited about this informal learning and sharing space for parents and other beloved adults and we hope you'll join us on Thursdays, starting next week. Storyline Online features Screen Actors Guild members reading favorite stories aloud. International Children's Digital Library is an incredible collection of digitized books in a wide variety of languages from around the world. Tumblebooks is a collection of animated, talking picture books. Loyal Books is a collection of freely available audio recordings of classics that are now in the public domain. Here, you'll find a variety of SK favorites (like Alice in Wonderland, Aesop's Fables, and more). Books can be streamed online or downloaded in a variety of formats. We are also exploring the addition of audio and/or electronic books to the SK library. If you have ideas or suggestions, please send them my way (rgoldberg@summers-knoll.org). "What should I read next?" is one of a librarian's favorite questions. But it's also one of the most daunting because a) each reader is unique, b) there are SO MANY good books to read and c) disappointed readers are the stuff of librarians' nightmares. Thankfully, there are many places from which to get excellent book recommendations, read reviews, and browse "read-alikes" (books that have similar characters, themes, or other traits similar to beloved titles). Of course, people are the best recommenders. Your friends, teachers, local librarians, parents, and other loving adults are all great sources for book recommendations. Below, you'll find web resources that may also aid you in your quest to find the perfect book. This list is not exhaustive and I will continue to update it as I find new resources for the SK library community. The Ann Arbor District Library has dozens of recommended book lists by grade level and interests. The American Library Association also has excellent lists of award-winning books. What should I read next? is a book recommendation generator that uses an algorithm to recommend books based on the title of a book you've already read. Keep in mind that the recommendations are generated by a computer (based on the likes and recommendations of other readers) and that the list of recommendations it generates may or may not suit you. Biblionasium is an online community where kids read and share reviews. Anyone may use the site for reviews but, before joining (to post or share), children must obtain parental permission. Scholastic's Teacher Book Wizard is a tool designed to help teachers find appropriate grade-level or reading-level books. My thoughts on "leveling books" aside (I am, for the most part, opposed to this practice), this may be a useful tool for readers (or their teachers or parents). You can also search by keyword, which is a nice feature. Guys Read is a literacy organization dedicated to encouraging boys to read. It is the brainchild of the First National Ambassador for Young People's Literature, Jon Sczieska. The website includes book lists by topic, genre, and "best book" lists created by beloved authors (such as Gordan Korman and Daniel Handler, for example). I'm hesitant to label books by gender but I do appreciate all efforts to encourage young people (guy or otherwise) to read more books. A Book and a Hug is a place to browse for books, read reviews, and watch interviews with favorite authors and illustrators (such as Patricia Polacco, Kadir Nelson, and Genifer Choldenko, for example). NoveList is a database of reviews and recommendations that is accessible through the Michigan eLibrary. To get to NoveList, go to the Michigan eLibrary, select "databases," and scroll down to "NoveList." This database is freely available to Michigan residents thanks to the Michigan eLibrary. If you have other great places to find book reviews and recommendations, please send them my way. Greetings from the physical and metaphorical heart of the school. I'm excited to report that our "physical" center is growing as we begin expansion of the library into the middle school commons. Within the next few weeks, we will be adding new titles and shifting some of our fiction collection into the first floor middle school commons. Stay tuned for photos of our progress.